With UV disinfection system you no longer have to be concerned about waterborne pathogenic organisms causing illness. UV systems kill bacteria, viruses, and other pathogens by preventing them from reproducing. Water softeners that use salt reduce the hardness of water by using an ion exchange process. This process replaces the minerals, like calcium and magnesium, that cause the hardness. Instead of removing them from your water, the Pelican Water’s NaturSoft Salt-Free Water Softener system, simply neutralizes these minerals so they don’t stick to surfaces. The Pelican water softener naturally softens water without the use of electricity, salt or brine. It functions by taking minerals from solution through precipitation as well as reducing the water’s surface tension. This is done without the use of any chemicals and the end result is a certified 99.6% success rate in scale prevention. The minerals in the water become neutralized so they no longer stick to you plumbing fixtures and hardware surfaces. 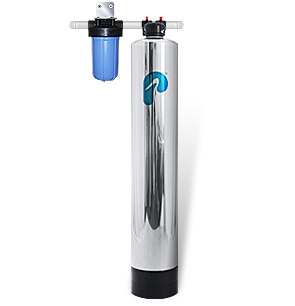 Pelican Water softeners lead the market in salt-free water softening systems. Our NaturSoft Salt-Free Water Softener provides several benefits, including prolonging the lifespan and effectiveness of household appliances and providing your family and pets with better drinking water. 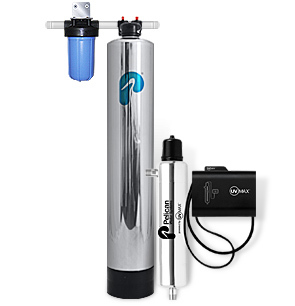 The Pelican water softener is maintenance-free care, eco-friendly, and easy to install. We offer the only salt-free water softener certified 99.6% effective in preventing scale buildup. The Pelican system removes hard water scale from your plumbing and appliances, and your home’s water pipes will be corrosion free, and you’ll have cleaner dishes and clothes. The Pelican NaturSoft system does not generate any water water because no salt is used in the process. Therefore, no salt brine or harmful chemicals are released into the environment. Our softener also does not require any electricity, which further reduces your impact on the environmental. While salt water softeners remove minerals that are good for you, the Pelican water softener leaves the minerals in the water that are good for your health. Not only will you have healthier looking skin and hair, your water will be great for your family’s health, as well as your pets! Our Pelican NaturSoft system comes ready to install, so you don’t need to hassle with a expensive installation process or costly long-term maintenance. Unlike a salt-based system, it requires no salt replacement packets and there is absolutely no operating cost, which saves you hundreds of dollars every year.